The controversy born out of the proposed decision to change the name of Doon University to Maharishi Valmiki University has turned into a war of words between the supporters of the government decision and the students of the university who are protesting against it for last 10 days. Uttarakhand Chief Minister Harish Rawat has stressed on collective efforts from followers of every religion towards taking the state on the path of development and prosperity. On the fourth day of the ongoing annual function of Uttarakhand Sanskrit University, Vice-Chancellor Prof Mahavir Aggarwal said, the youth needs to take the mantle of preserving and conserving the rich ancient heritage and culture. While there is a scramble for ticket among BJP leaders for the five Lok Sabha seats in Uttarakhand, Congress leaders do not seem very enthusiastic about contesting the elections this time. The BJP leaders are vying with each other for the ticket as they sense victory due to a number of factors, including anti-incumbency, inflation and the popularity of party’s prime ministerial candidate Narendra Modi. Chief Electoral Officer (CEO) Radha Raturi on Wednesday issued a show-cause notice to Chief Minister Harish Rawat on a complaint lodged by BJP senior leader Prakash Pant on behalf of the Uttarakhand BJP for the violation of model code conduct by using the Bijapur guest house. Far from improving efficiency, the restructuring of the Uttarakhand Secretariat where-in promotions and 22 new sections were created has only added to the woes of the Secretariat staff and imposed financial burden on the government. Residents of Thapaliakhera forest village under Sailanigoth gram panchayat in Tanakpur subdivision of Champawat district are hopeful that at least a few candidates would visit their village before the upcoming Lok Sabha elections. A Dehradun-based NGO, Society of Pollution and Environmental Conservation Scientists (Specs), has expressed concern over useless burning of wood in the name of festival of Holi, terming it as a waste of wood wealth, which could have been used for some useful purpose instead. Chief Minister Harish Rawat has revealed his agenda of governance saying the re-construction of the natural disaster-ravaged Uttarakhand was a big challenge for the government. He said his government planned to develop the state with the help of technology and stop migration from villages by improving agriculture avenues. The Uttarakhand unit of the BJP has taken exception to Chief Secretary Subhash Kumar's announcement that the government will financially support senior citizens on their pilgrimage to Char Dhams and Piran Kaliyar. In a major decision, Nainital High Court has questioned the very appointment of incumbent Chief Wildlife Warden (CWW) asserting that proper procedures towards creation of CWW's post were never followed in the state and thus directed for a fresh appointment. Environmentalist, mountaineer and academician Harshvanti Bisht has bagged the coveted Sir Edmund Hillary Mountain Legacy Medal for her contribution to environment and community work in the Gangotri region of the Garhwal Himalayas. In view of the ensuing Lok Sabha elections, political leaders from various parties have started visiting Kapkot villages in Bageshwar district after a gap of five years. The Congress started its three-day statewide Jansampark padyatra from Haridwar today. Dehradun Institute of Technology (DIT) University celebrated its first foundation day at the university campus, here today. Formerly known as Dehradun Institute of Technology, established in 1998 received the status of a university on March 12, 2013. Manu Kochhar and Prashant V Mahadik have been elected Chairman and Vice-Chairman, respectively, of the Confederation of Indian Industry (CII) Uttarakhand State Council for 2014-15. 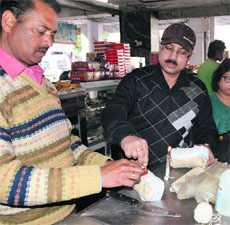 A team of the Department of Food Safety today launched a food sample collection drive in the city. Members from the Uttarakhand chapter of Centre of Indian Trade Unions (CITU) have submitted a memorandum to the state chief election officer regarding a five-point demand raised by them in wake of the forthcoming general elections in the state. The municipal council of Mussoorie, sensing fraud, has cancelled the permission given to telecom operator for digging road for laying OFC cables on Mall Road in Mussoorie today. The 92nd Founder Day’s and reunion meet began at Rashtriya Indian Military College (RIMC) here today. Distinguished alumni of the RIMC have started arriving at their alma mater. An 80-year-old woman was shot at by unidentified assailants outside her house at Mehboob Colony, Brahamawala, in the Patel Nagar police station area last evening. The Polykids organised the annual sports day here yesterday. In a play group race, Rabhya stood first, Kriti second and Avani third. Chain-snatching incidents continue unabated in the city. A woman was robbed of her gold chain in the Prem Nagar area today. A 21-year-old girl committed suicide by hanging herself from a ceiling fan at her house in the Raipur police station here this afternoon. Meanwhile, the chairman of State Safai Karamchari Commision, Bhagwat Prasad Makwana, has written a letter to the governor and chief minister, claiming that the widespread opposition against the government's decision to change university's name in the name of Maharishi Valmiki is inappropriate and certain sections of society are misleading the university students on the issue. He has mentioned in his letter addressed to both governor and chief minister that there are a number of educational institutions in the country, which are in the names of distinguished persons such as Mahatma Gandhi, Indira Gandhi, Rajiv Gandhi, Swami Vivekanand, BR Ambedkar and Hemwati Nandan Bahuguna. So, why is there so much opposition against the name of Maharishi Valmiki, who wrote a great epic like Ramayana, he wrote in his letter. He also demanded that the government should not succumb to any pressure and the decision to change the name of the university must be followed. On the other hand, the students are still boycotting the classes and are saying that they will not attend them till Cabinet rolls back the decision. “The allegation being put on the students of being discriminatory is not right and we honour Maharishi Valmiki and we are aware the he was a great Hindu saint and represents the great Indian culture. Our point of view is that the identity of the university should not be changed and changing the name of the university will not benefit the community,” said one of the protesting students. The CM expressed this opinion while talking to a delegation of minorities that met him today and included religious scholars and gurus from Muslim, Sikh, Christian, Jain and Buddhist communities. Chief Minister Harish Rawat said a feeling of camaraderie between followers of various religions was very necessary to take the state and nation forward. He also said that Uttarakhand had always given a message of communal amity and asserted the minority community members were actively contributing in relief and rehabilitation works in Uttarakhand in the aftermath of last year's rain disaster in the state. Deoband Darul Ulom's Mufti Habibur Rehman appreciated Uttarakhand Chief Minister's efforts towards ensuring communal harmony in the state. He lauded Harish Rawat's secular credentials. Jain religious guru Alok Muni, Singh Sabha president Rajendra Singh Rajan and Sewa Singh, Father SK Singh from St James Church, Buddhist Tibetan community's Khempo Rangdale were prominent among those, who were part of the delegation. Syed Mohammad Kasim, who coordinated the event thanked the chief minister for his continuous concern towards minority welfare issues in the state. He assured all support from minorities in the rebuilding efforts in the disaster-torn Uttarakhand. After the Saraswati Vandana, the intellectual round commenced, where various events were held such as Sanskrit-based quiz, elocution, Sanskrit verses recitation and chorus. More than six Sanskrit educational colleges are participating in these events, the result of which would be announced on March 13, the concluding day of the six day annual function. V-C Aggarwal said while Mackaulay led western education-based educational institutes are lagging behind in imparting moral, culture, value-based education, Sanskrit language-based schools and colleges that are still carrying forward the Vedic education mode, keeping alive the Indian culture. Sanskrit literati Dr Veena Shastri, member of the management committee Sati Kund, Mahila Maha Vidyalya, Kankhal, said, “Sanskrit language needs to be popularised, as it’s the mother of all language and flag bearer of Indian civilization.” Dr Veena said only in Sanskrit there is both science and ayurveda, which have been aptly depicted in the verses written by Kali Das. Host Shri Bhagwan Das Adarsh Sanskrit Maha Vidyalya principal Dr Bhola Jha said the youth has a pivotal role to play in conserving Sanskrit language and mooted for Uttarakhand Governor Dr Aziz Qureshi’s suggestion of providing free Sanskrit language classes by Sanskrit educational institutions, for taking the ancient language to the masses. Three former Chief Ministers BC Khanduri, Ramesh Pokhriyal Nishank and Bhagat Singh Koshiyari are serious contenders for the party ticket from the Pauri Garhwal, Haridwar and Nainital Lok Sabha seats, respectively. The fight for the ticket is so intense that it has led to a near rebellion by two senior party leaders, who are reportedly not being considered for the elections. Though the central party leadership is yet to announce the names of the candidates from the five seats, Bacchi Singh Rawat, a former Union minister and senior leader, has resigned from party posts after his name was not included in the list of probable candidates from the Nainital seat sent by the Uttarakhand BJP to the central parliamentary board. Munna Singh Chauhan, another senior party leader, was a contender for the ticket from Tehri Garhwal. He had publicly criticized sitting BJP parliamentarian Mala Raj Luxmi Shah. Hectic lobbying is also on for the ticket from the Almora (reserved) Lok Sabha seat. Ajya Tamta, who suffered defeat in the 2009 parliamentary elections, Rekha Arya and Chanar Ram are trying for the party ticket from Almora. On the other hand, though the Congress has four sitting MPs, enthusiasm for the party ticket among the leaders is missing. The party is in a dilemma to choose the candidates for the Haridwar and Tehri Garhwal seats. Harish Rawat was elected from the Haridwar Lok Sabha seat in 2009. He became Chief Minister recently but the party was yet to decide the candidate for the elections from the constituency. Harish Rawat’s daughter Anupama Rawat has been nursing the Haridwar parliamentary constituency for the past several years. It would be interesting to see whether he prefers his daughter or asks for ticket for his wife Renuka Rawat from Haridwar. Similarly, former Chief Minister Vijay Bahuguna and his son Saket Bahuguna are unclear about who would fight from the Tehri Garhwal. Vijay Bahuguna had won the Tehri seat in the 2007 byelection following the death of Maharaja Manvendra Shah. He again won the seat in the 2009 General Elections. However, after his elevation as Chief Minister in 2012, the Congress gave the ticket to his son Saket Bahuguna to fight the Tehri byelection but he lost to Mala Raj Luxmi Shah, daughter-in law of Manvendra Shah. Vijay Bahuguna during his tenure as Chief Minister nursed the Tehri Garhwal parliamentary constituency very well and Saket had been preparing for the Lok Sabha poll since long. However, as a tough electoral battle is expected, it is unclear whether Vijay Bahuguna would contest the elections or ask for the ticket for Saket. Congress sources say Vijay Bahuguna will be in a better position to give a fight to the sitting MP than his son. Meanwhile, Vijay Bahuguna had announced that he would not contest the elections. According to the sources, even sitting Nainital parliamentarian KC Singh Baba is not very keen to contest the elections this time. A sitting MP from Nainital since 2004, KC Singh Baba is reportedly reluctant to contest the forthcoming elections. Satpal Maharaj, MP from Pauri Garhwal, will also face a tough fight from a formidable challenger, BC Khanduri of the BJP. In the notice addressed to the Principal Secretary to the Chief Minister, the CEO has said that according to the model code of conduct, the Bijapur guest house cannot be used for more than 48 hours by an individual. She has demanded explanation on the issue. The District Magistrate and district election officer of Dehradun BVRC Purushottam has ordered for the deposit of all the licensed arms with the district administration till the general elections get over. He also said that the sale and purchase of the arms in the district would not be allowed in between to ensure peaceful elections in the district. It is to be noted that guards with banks having arms will be exempted from depositing the arms. Meanwhile, the arms of the license holders will be given back to them once the counting of the votes will be over. While the restructuring has led to the addition of 22 new sections and promotion of 151 secretariat staff, it has not translated into improved and efficient functioning. Out of the 22 new sections, four continue to be without staff. Further without the designated offices, the staff is yet to begin functioning fully. Most of the time they are either working from borrowed space or are forced to miss on important work. A total of 151 promotions were also affected at the level of section officers (72), under secretary (49), deputy secretary (21), joint secretary (8) and additional secretary (1). These additional posts were created for 22 sections, out of which four continue to be vacant. These include disaster management, forest and environment, home, industrial development sections. There are a total of 128 sections in the Secretariat. In keeping with the creation of the new departments such the Right to Information ( RTI), Right to Service and Samadhan (Suraj and eradication of corruption), the creation of new sections at the Secretariat was long overdue. So, in right earnest, 22 new departments were created and the restructuring of the secretariat staff structure was also carried, after it was approved by the erstwhile Vijay Bahuguna government. The restructuring was to take load off the excessively burdened sections comprising irrigation, urban development, culture and tourism, transportation, environment and forest, rural development, panchayati raj, agriculture, social welfare, disaster management and rehabilitation, home, education, medical education, law, technical education, industrial development, finance and secretariat (administration). While lack of designated space continues to be a major concern, the creation of additional posts to run the new sections which are expected to be around 215 at the level of review officers, 29 at the level of clerical staff, 19 at the level of personal secretaries and nine at the level of additional secretaries are expected to add to the non-Plan expenditure of the state. According to one estimate, the government would be spending around Rs 5 crore per person per month. The villagers claim not a single MP visited the area in the last 53 years, since they settled in this forest land in 1960. “We are expecting some local leaders to visit this time,” said Mohan Singh, a senior citizen from the village. According to the villagers, being a forest village, they are bereft of any civic facilities provided by the government. “After great efforts, we got voting rights in 1999 and have regularly cast our votes thereafter. Due to lack of proper routes to Tanakpur market, we are bound to cross into Nepal to enter into our village,” said Mohan Singh. The villagers said over 150 voters demanded revenue status for the village, before casting their vote in favour of any candidate. “For us, the ideology of a political party does not count. What counts is its commitment to get us revenue village status so that we can get all facilities being given under several developmental programmes of the central and state governments,” said another villager. The villagers have also demanded a polling booth in their village for the coming Lok Sabha elections as they have to travel up to 8 kilometres to exercise their right. “We also want construction of a road from the village to the main market as we are surrounded by Nepali territory from the north and the eastern side and by the Sharda river on the southern side. The western side that connects the village with the mainland, remains waterlogged during monsoon that cuts off the village from civilization for four months,” said the villagers. Addressing a press conference in Dehradun today, Brij Mohan Sharma, Secretary, Society of Pollution & Environmental Conservation, revealed that as per their survey in Dehradun, around 529 holikas are set to be lit in the name of Holi. ''It will waste around 500 to 1000 kg of wood per holika. Thus a total of 3,96,750 kg of wood will be burnt, which means Rs 19, 80,750 will be wasted in the name of the tradition,'' Sharma, said adding that this wood could be used for some other useful purpose. ''An average village family in Uttarakhand uses around 4 kg wood per day to make their food. It means 15,493 families can make food with the fuel which is wasted in a few hours,'' Sharma pointed out. Similarly, he said on an average a family member uses approximately 4 buckets of water after Holi for bathing, washing floors and washing clothes. It means around 100 litres water will be consumed. ''If 70 per cent residents will play Holi, then around 40,61,1750 litres of potable water with harmful colors will drain and pollute the eco system,'' he said. Like previous years, Specs this year too collected 100 samples of various Holi colours from Dhamawala, Paltan Bazaar,Hanuman Chowk,Moti Bazaar, Karanpur,Dakra , Kanwali Road and other market areas of Dehradun. ''Tests in our laboratory show that there are a lot of harmful metals in these colours, which include mercury sulphite in red colour , copper sulphate in green colour, chromium Iodide in purple colour, aluminium bromide in silver colour, lead oxide in black colour,'' he said. ''These colours are toxic and can cause skin cancer, eye allergy, temporary blindness, bronchial asthma and allergies,'' he added. Specs also collected 25 samples of mava in which 18 samples were found adulterated with harmful substances. Out of 18 adulterated samples 7 were totally synthetic which contain chemicals like urea, detergent, arrarot powder and refined oil. Specs this year also checked the so-called natural organic colours available in the market and astonishingly found that 52 per cent of these colours are adulterated. The Chief Minister said this while addressing large gatherings during the Holi Milan programmes at Lohaghat and Danya yesterday. He admitted that poverty was on the rise in the state after it was carved out of Uttar Pradesh. “We have decided to start Chakbandi by establishing demonstration units at every block in the state. The number of units will be increased if the experiment is successful,” he said at a meeting at Lohaghat town in Champawat district last evening. Harish Rawat emphasized on opening the Char Dham route before the yatra begins this year. He said his government had a vision to promote cultural tourism on priority. “We are trying especially to clear the Char Dham yatra route,” he said. The Chief Minister, while addressing Congress workers at Danya in the Jageshwar Assembly segment of Almora district, said he was worried that villagers were leaving their traditional villages as agriculture had become uneconomical. “We have decided to promote traditional agriculture in hill villages and equip the villagers with the modern technology so that they could get better returns,” he said. The Chief Minister added his government had decided to invest Rs 100 crore in the name of freedom fighter Munshi Hari Ram Tamta to promote traditional crafts in the state. Former Speaker and senior BJP leader Prakash Pant, along with other leaders, met Chief Electoral Officer Radha Raturi yesterday and urged her to restrain bureaucrats from making such announcements when the model code of conduct is in place. “The government is using bureaucrats to make such announcements, which is against the poll code," alleged Pant. During the meeting, the BJP leaders also sought clarification on the issue of tender allotment and the minimum amount of cash that could be carried in private vehicles. Later, while talking to mediapersons after the meeting with Radha Raturi, Pant said, “According to the poll code, works under the old tenders will continue but the government will have to seek prior permission while inviting fresh tenders. Besides, vehicles carrying cash worth Rs 10 lakh will not be impounded, provided the money is not meant for the election purpose. And such vehicles will be allowed to go only after providing necessary information to the Income Tax Department,” said Pant. Further, according to the new guidelines of the Election Commission, each candidate would be allowed to spend Rs 70 lakh on his election expenditure. Earlier, the ceiling was Rs 50 lakh. The court’s ruling came on a petition filed by People For Animals, Uttarakhand member secretary Gauri Maulekhi, in Nainital High Court. 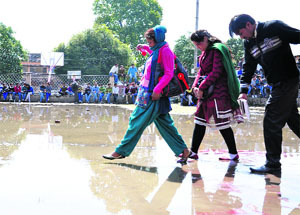 “Nainital High Court today directed for fresh appointment of the CWW after creation of the post according to due procedure,” Gauri Maulekhi told The Tribune. As per the information received under Right To Information Act in 2013, it was revealed that the state Forest Department had no government order regarding the appointment of the CWW. “After this was revealed, the department had issued a GO appointing SS Sharma as the CWW on backdate,” Maulekhi observed. The award presentation ceremony will be held at the International Centre for Integrated Mountain Development (ICIMOD) headquarters in Kathmandu on March 17. Harshvanti, an accomplished mountaineer, along with Rekha Sharma and Chandra Prabha Aitwal were the first three women to summit the main peak of Nanda Devi (7,816 m) in 1981. She was also a member of the Indian expedition to Mt. Everest in 1984. However, the Hillary medal is awarded for philanthropic achievements and not for mountaineering. Harshvanti is credited with undertaking the first successful bhojpatra plantation in the Indian Himalayas for eco-restoration of the Gangotri-Gaumukh region. Harshvanti, who hails from Uttarkashi district, has been engaged in the birch (bhojpatra) plantation since 1992 in the fragile Gangotri region. She has very successfully nurtured a birch nursery at Chirbasa and planted as many as 12,500 saplings at Bhojbasa. Significantly, she along with the Mountain Legacy is currently initiating a project to promote the establishment of a network of women mountaineering clubs at universities throughout the Himalayan region. The coveted award is given in the memory of Sir Edmund Hillary who along with Nepalese Sherpa Tenzing Norgay was the first to scale Mount Everest in 1953. Peter Hillary, who represents the Hillary family on the Hillary Medal Selection Committee, is the son of Sir Edmund Hillary and is himself an avid mountaineer. He climbed Mt Everest in 1990 and 2002. The Hillary medal is a project of the Mountain Legacy, a Nepalese NGO. The Sir Edmund Hillary Mountain Legacy Medal Selection Committee chaired by Dr Beau Beza of the Environment and Planning Programme selects the Hillary medal recipients at the Royal Melbourne Institute of Technology University. Harshvanti, also an Arjuna awardee, is at present a faculty member at Government Postgraduate Degree College at Doiwala in Dehradun. She expressed happiness over her selection for the coveted medal that too instituted in the memory of Sir Edmund Hillary. However, villagers said they would boycott the elections if their problems were not solved. “With the elections nearing, politicians have started visiting the villages to garner support. They did not come once in the past five years. No leader even took stock of the situation post the natural disaster last year,” said Prakash Tamta, a resident of Kharahi Patti, Bageshwar. Residents of Kharahi, Nakuri, Bohala Patties and Kanda subdivisions of the district said they were fed up with “false” assurances of politicians in the past 12 years. Leaders had promised to sanction funds for the roads, bridges and drinking water schemes in the area. They had also assured them of recruiting doctors and other medical staff in primary health and sub-centres. However, nothing had been done so far. “Now after our boycott threat, politicians have started visiting the area fearing defeat. The local MP and some MLAs also recently visited the area and assured the villagers of fulfilling their demands if they were voted to power,” said Mohan Singh Gasyal, a resident of Rithagar village. Congress MLA from Kapkot Lalit Farswan said several villages in the Kapkot area were being linked with roads and the budget had already been sanctioned for the same. Chief Minister Harish Rawat and state Congress president Yashpal Arya took part in the padyatra. In his brief address, the Chief Minster said the Congress had a history of sacrifices. "Indira Gandhi and Rajiv Gandhi laid down their lives for the unity of the nation," he added. He said the Congress would win all five Lok Sabha seats in Uttarakhand. Yashpal Arya said the Congress had always worked for the welfare of the Dalits, the Muslims and other deprived sections of society. The foundation day began with the ‘Havan’ organised at the central lawn of the university campus in which all faculty and staff members of the university participated, followed by an inauguration ceremony and lightening of the lamp. Speaking on the occasion, Vice-Chancellor Krishna Kumar outlined the progress of the university and highlighted some of the achievements of the students. Sharing the vision of the university, he also presented the challenge of innovation before its community of scholars and called upon them to create and disseminate knowledge in newer, different and superior ways. The day was filled with fervour with students from various departments showcased the best of music, dance and cultural presentations. The celebrations concluded with a certificate award and distribution ceremony for the winning participants from among the faculty and students who took part in a number of state and national level events, held last year. At present, Kochhar is Joint MD, Unique Hotels and Restaurants Pvt Ltd (Hotel Madhuban) and Director, Madhuban Academy of Hotel Administration and Research. He joined the family business of hotels and restaurants in Dehradun and took active interest in the expansion of Hotel Madhuban. He also launched the city's first exclusive Chinese Restaurant in 1984. He also took up the construction of a luxury hotel in Mussoorie in 2008. Kochhar served on the Board of Governors of the Institute of Hotel Management, Dehradun. 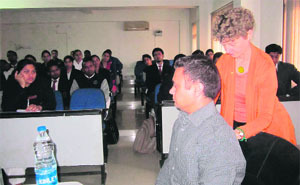 He is involved in several cultural activities with social institutions in Dehradun. Mahadik is Chief Manager (Haridwar complex) at ITC Limited. He is a mechanical engineer and also holds diplomas in business management and information systems management. He started his career with Godfrey Phillips India Limited and worked in various functions like production, engineering and projects. His last assignment at the GPI was handling international projects on technology transfer. After spending 26 years at the GPI, Mahadik joined ITC Limited. At present, he heads the Haridwar complex of the ITC comprising three business divisions, foods division, personal care product division and packaging and printing division. The team, led by designate officer of the Food Safety Authority, Dehradun, Anoj Thapliyal, collected eight samples of edible oil , ghee, bread from Motherawala and Chander Nagar in view of the coming Holi festival. The samples would be sent to the Rudrapur laboratory for analysis. 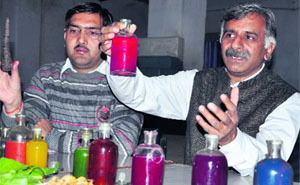 “The drive will continue till Holi, so that shopkeepers could be dissuaded from selling adulterated material,” said Thapliyal. The suggestions put by the members included: provision of one vehicle per constituency for the transport of publicity material in wake of the tough geographical terrain, as per the model code of conduct a strict check on the money being spent by the leading political parties in the campaigning, a complete stop on the money and liquor distribution during the campaigning by the political parties, strict action against the anti-social elements for threatening the voters or forcing them to vote for a particular party/candidate. Dr Marg Perrott and Dr Tajinder Singh, physiotherapists from Kilmore Physiotherapy Centre, Australia, delivered an enlightening lecture and demonstrated recent skills utilised in the examination and treatment of shoulder ailments. The lecture was attended by the final year and postgraduates students of the department of physiotherapy. Speakers highlighted the need of evaluation of shoulder dysfunction in the light of new trends and developments in the field of physiotherapy. Dr Maneesh Arora, head, department of physiotherapy, proposed a vote of thanks. The telecom operator Reliance GO was given the permission to dig the Mall Road to lay down the OFC cables by digging the road by MC a few months back, but the telecom operator, misusing the permission given to it, entered into a fraudulent arrangement with two other private telecom companies and was caught laying down their cables at the same cost without seeking any prior permission from the council. The municipal council executive officer Azhar Ali after learning about the incident has cancelled the permission and served a show-cause notice to the said company here. The executive officer Azhar Ali, when contacted, said that Reliance GO was given permission at the cost of around Rs 63 lakh to lay down its own cables but it had entered into an arrangement with two other telecom companies illegally and was found laying the their cables on the same dug up road which was against the municipal laws, resulting in cancellation of the permission to continue the work further. An explanation has also been sought for indulging in such fraudulent act by the telecom operator, said Ali. The residents who have been complaining about the substandard work done by the telecom operator also said that the granting of only one permission at the cost of two others to the telecom operators was uncalled for and the council should take legal course to punish the guilty. The residents also alleged that the whole matter was in the knowledge of the previous executive officer who granted the permission to the said company and turned a blind eye to the cables of other two companies being laid down here. Meanwhile, the SDO, BSNL, Ganesh Kothari, also said that the private telecom operators while laying down their own cables had damaged BSNL cables rendering around 200 phones and broadband connections out of order. He also sought punitive action against the erring contractors of the private telecom operator here. The MC president Manmohan Singh Mall when contacted said that he has directed the officials to conduct a thorough investigation in the matter and initiate strict action thereafter. On the first day of the reunion meet, a special hockey match was organised between the present cadets and the old students. The present cadets won the match 4-3. Meanwhile, the Shivaji section won the finals of the Inter-Section Boxing Competition defeating the Pratap section 26-25. The Ranjit section stood third with 25 points while the Chandragupta section got the fourth position with 13 points. A special horse show will be held tomorrow followed by a cricket match between the old boys and the cadets. The Doon Tusker team defeated Graphic Era University (GEU) in a match during the 62nd Dehradun District Cricket League here on Wednesday. After losing the toss and being put into bat first, Doon Tusker showcased brilliant batting performance and made 182 runs. Hider scored 61 runs and Harry made 51 runs for Doon Tusker. In reply, the Graphic university team had a bad start with both openers getting out without scoring much runs. The entire team was out at 157 runs. It lost the match by 25 runs. The victim, Fulmizra, was alone in the house when some persons knocked the door and called her son's name. When Fulmizra went to open the door, the assailants opened fire on her. She has been admitted to Himalayan Hospital. The police said the attackers might have come to kill Fulmirza's son, Imran, who is a realtor. The exact number of the assailants is yet to be ascertained. The police are questioning Imran if he has professional enmity with anyone or someone has threatened him before over some issue. In a race for nursery boys, Prateek, Naman and Kavay bagged the top three positions, respectively. In the nursery girls' group, Nehal, Ahana and Shivaski were the winners. The victim, Deepa, was on her way back home after picking her children from school when two motorcycle-borne persons came from behind and snatched her gold chain. Naresh Rathore, in charage of the Premnagar police post, said the incident took place near the Mohanpur tea estate, which was a secluded stretch. A case has been registered in this regard. Police have started the investigations. The body was first noticed by her parents. No suicide note was found in the room. The victim was a student of MCom. The police have started investigations into the case.